We recently had the chance to review several products from the Ocean Saline Nasal Care line. Our non-medicated nasal products help you breathe easier by providing convenient, pre-mixed, easy-to-use nasal saline solutions for the entire family." 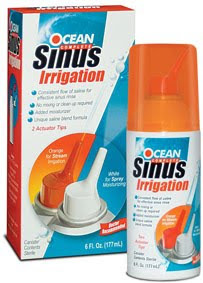 "OCEAN Complete® Sinus Irrigation provides a convenient and easy to use two-in-one nasal saline therapy: a special nozzle for nasal sinus irrigation and a unique saline mist applicator for nasal moisturizing. Utilizing an exclusive non-medicated salt blend formula, the OCEAN brand nasal sinus irrigation system is safe for frequent daily use. The orange nozzle irrigates and liquefies mucus, clearing nasal passages, while the white nozzle provides a moisturizing saline mist to counteract dry climates. When should you use OCEAN Complete® Sinus Irrigation? -To relieve dryness associated with oxygen treatments and CPAP machines for sleep apnea"
"For more than 30 years, OCEAN® Saline Nasal Spray has been the non-medicated nasal brand recommended most by doctors. Since 1973 it has earned the trust of health professionals and millions of people suffering from chronic nasal congestion, sinus congestion, dry nose, and irritated nasal passages resulting from allergies, sinusitis, sinus infections, colds, rhinitis, nasal surgery and more. When held upright the OCEAN® Nasal Spray bottle delivers a fine mist. Held horizontally, the bottle produces a stream, and when held upside down, it delivers saline drops with a gentle squeeze. When should you use OCEAN® Saline Nasal Spray? "Specifically formulated for newborns and children up to 12 years of age, OCEAN for Kids® Saline Nasal Spray provides instant, soothing relief to irritated nasal passages. 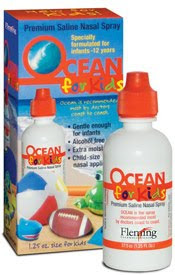 The natural, non-medicated OCEAN® Nasal for Kids product has a smaller spray tip to fit smaller noses and contains glycerin for extra moisturizing, which results in less stinging and burning. Moreover, it is safe to use as often as needed, because it is drug free. When should you use OCEAN for Kids® Saline Nasal Spray? -To moisturize and irrigate membranes following nasal surgery"
What we thought: Unfortunately, I suffer from frequent sinusitis and year round allergies. Fortunately, Ocean Saline Nasal care has an entire line of non-medicated relief for all of my sinus/allergy issues! I have tried several sinus irrigation methods and the Ocean Sinus Irrigation is definitely the most effective and immediate method I've tried. Seriously, instant results! I used this amazing product before bed and noticed a bit of a sore throat the morning after for the first few days, but after that, no side effects at all...and a minor sore throat was nothing compared to the pressure I felt before the irrigation...definite relief:) The Saline Nasal Spray is great too because you can use differently depending on the relief you need. I love that these products are safe to use on a daily basis and they really do provide relief without drying out your nasal passages. I also love that they have a special product just for kids that is a wonderful non-medicated option for when the little ones get stuffy, which is guaranteed to happen a least once this cold and flu season. If you suffer from allergies, sinusitis or colds during the winter season or any time of year, Ocean has a product to help:) ABCD Diaries gives Ocean Nasal Care an A+! Buy It: Find these wonderful Ocean products at Walgreens, Rite Aid, Costco and more!! Win It: One ABCD Diaries reader will win a set of all three items we reviewed, Complete Sinus Irrigation, Saline Nasal Spray and Ocean for Kids!! To enter, become a follower of ABCD Diaries via GFC(if you already follow just say so:) and leave a comment below. Disclosure: ABCD Diaries was given set of Ocean products for review purposes only. We were in no other way compensated. The opinions expressed in this post are ours and ours alone. I follow on GFC. I have serious sinus issues too and I LOVE LOVE LOVE this stuff! I use the spray three times a day and I definitely notice a dramatic difference. I haven't tried the Sinus Irrigation, but I might have to now! I entered the Ruth's Brownie Kitchen giveaway! I entered the Cowgirl Chocolates giveaway! A great idea. Thank you for the opportunity to win. I am following, liking, joining and subscribing. My grandson could use this with constant allergies and runny/stuffy nose. Subscribed via google reader #2.
paragraph is genuinely nice, all be able to easily be aware of it, Thanks a lot.